While the classical period focused on idealized figures, Hellenistic artists explored a wider range of subjects — including the wounded and defeated, and the very young and very old. A new interest in drama and engaging the viewer also characterizes this period. 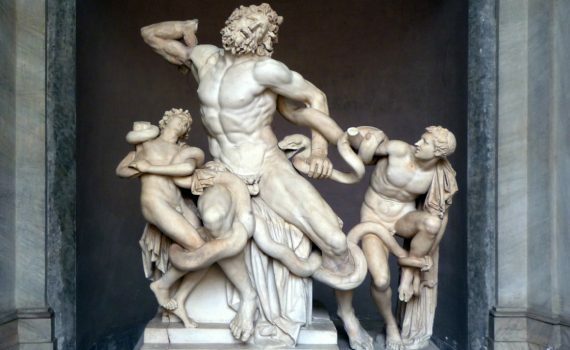 The writhing agony of the Trojan Laocoon made this Hellenistic masterpiece famous throughout history. Part man, part goat, this companion of the god of wine relaxes after a night of drinking. Look closely to see bloody wounds and a lifetime of scars on this defeated athlete. Greek gods battle Giants for supremacy of the universe, so deeply carved that they almost step out into our world. On the island of Samothrace, the wind whipped the clothing of this stone goddess of victory. Pain is visible on the face of this dying warrior. Did the ancient Greeks sympathize with their defeated enemies?